Some weapons are so indelibly associated with the wars in which they excelled or otherwise became inextricably linked that the mere mention of the war conjures them into the mind. This fact holds as true for warplanes as for any other type of weapon, and one of the types that springs to mind at the mention of World War II must surely be the Stuka, the nickname abbreviated from Sturzkampfflugzeug, the German word for dive-bomber that encapsulates the task of the Junkers Ju 87. Possessed of ungainly lines that nonetheless spoke strongly of aggression, it is perhaps more accurate to describe the Ju 87 as notorious rather than famous, for this warplane is generally considered within the context of the Blitzkrieg (lightning war) campaigns of aggression in which Germany overran Poland in September 1939, Denmark and Norway between April and June 1940, the Low Countries and France in May and June 1940, and finally Yugoslavia and Greece in April 1941. In these campaigns the Ju 87 was a major element of the ‘flying artillery’ that supported the German ground advances spearheaded by the Panzer (tank) divisions, and operated under the overall air superiority provided by the Messerschmitt Bf 109 fighter to roam at will into the front line and the areas immediately behind it, knocking out point targets such as defensive strong points and harassing the columns of road-bound refugees clogging the lines of communication so desperately needed by Germany’s victims. It was in these circumstances, with its appearance of raptor-like ferocity emphasised by the screaming ‘Jericho trumpet’ sirens attached to its main landing gear legs, that the Ju 87 built up its reputation from the time that three aircraft of this type opened World War II by bombing the approaches to the two Dirschau bridges over the Vistula river in Poland at 04.34 hours on 1 September 1939. Yet the Ju 87 was in fact a very limited warplane, a fact soon revealed when the type was forced to operate in the face of effective fighter opposition: this happened in the Battle of Britain (summer 1940), and resulted in very heavy losses for the Stuka force. There was no adequate replacement for the type, however, so the Ju 87 remained in development, production and service even though its most ardent protagonists were forced to concede its technical and tactical obsolescence. The origins of the type can be traced to 1933, the year in which the Nazis acceded to power in Germany and started a major programme of military expansion and re-equipment. This effort was initially undertaken in secret, along the lines already established by the forces previously permitted to the Germans by the 1919 Treaty of Versailles that had finalised their defeat in World War I. The treaty permitted Germany to possess only small land and naval forces with weapons that were strictly limited in capability, but denied Germany the right to possess any type of air force or to undertake the development and production of any military aircraft at all, but the Germans had tried to keep abreast of technical and tactical developments with a covert programme that ran alongside their overt efforts. The design and construction of aircraft with a military application were undertaken by subsidiaries of German companies in neutral Spain, Sweden and Switzerland. Moreover, in return for aiding the development of the Soviet air force, the USSR permitted the Germans secret use of a major air base at Lipezk in the USSR for the evaluation of new warplane types and the training of air force personnel who would be the professional cadre on which the Luftwaffe would eventually be built, using large numbers of personnel who had learned about aircraft in German sports flying and gliding clubs. During the 1920s, the German forces undertook a detailed and pioneering operational analysis of their defeat in World War I, and came to the correct conclusion that defeat had become inevitable once the war, especially that on the Western Front, had settled into the stalemate of trench warfare. This type of positional warfare soon became a campaign of attrition that inevitably favoured the side with the greater manpower and larger industrial capability, and in World War I this was the Allies, especially after the USA had joined France and the UK in April 1917. Germany determined from the later part of the 1920s never again to become caught in a war of attrition, and therefore started an ambitious effort to devise ways of ensuring rapid German victory by a war of movement. It was this that led to the concept of Blitzkrieg, in which armoured forces would smash through the enemy’s front line and pour deep into his rear areas in large pince movements, in the process bypassing all major centres of resistance that would be destroyed by the following infantry, moving on foot or in horse-drawn vehicles. The concept of Blitzkrieg reached its definitive form once it was decided that the spearheads would be provided by tank divisions whose cross-country momentum would be maintained with the aid of tactical air power rather than conventional truck- and horse-drawn artillery, which was too slow to keep pace with armoured forces. Within this tactical air capability, pride of place was allocated to the dive-bomber, which could hit and destroy point targets with devastating accuracy. For reasons of emotion and national pride as well as military capability, the dive-bomber appealed strongly to the Nazi party, and greater emphasis was accordingly given to the dive-bomber after the party’s rise to power in January 1933. The Germans were already developing the Heinkel He 50 dive-bomber, admittedly to a requirement of the Imperial Japanese navy air force, but a major national emphasis was now added by the launch of the Sturzbomber-Programm (dive-bomber programme). While the definitive dive-bomber type was planned, designed, developed and placed in production, the so-called Sofort-Programm (immediate programme) resulted in the design of the Fieseler Fi 98 and Henschel Hs 123 to provide an interim capability, and of these the Hs 123 was the model that was selected for production. This interim capability provided the time required for the evolution of the definitive model, which was the subject of a requirement issued in January 1935 to Arado, Heinkel and Junkers even though the attached specification had been written round the imminent Ju 87. The design of this type had been started in 1933 under the leadership of Dipl.-Ing. Hermann Pohlmann, and the construction of three prototypes had been started in the summer of 1934. Thus it was only three months after the issue of the requirement that the Ju 87 V1 first prototype appeared for its first flight in April 1935 with the powerplant of one Rolls-Royce Kestrel V water-cooled V-12 engine rated at 525 hp (391 kW) for take-off and 640 hp (477 kW) at 14,000 ft (4265 m) and driving a two-blade wooden propeller of the fixed-pitch type. The Ju 87 was a low-wing cantilever monoplane of stressed-skin construction in light alloy, and for its design period was quite advanced. The structural core of the airframe was the oval-section fuselage, which was built in port and starboard halves that were then joined along the vertical centreline. From front to rear, this fuselage carried the engine in the nose with the engine coolant radiator under the forward fuselage, the two-man cockpit over the wing under a heavily framed enclose of the ‘glasshouse’ type, and the tail unit. This last was based on a flat, constant-chord tailplane that was installed in the high-set position, braced to the fuselage on each side by an inverted V-type strut, and carried rectangular endplate vertical surfaces. Tapered in thickness and also in chord except on the leading edges inboard of the main landing gear units, the wing was of the inverted-gull configuration: built integral with the fuselage, the sharply anhedralled inner panels extended as far outboard as the main landing gear units, where the dihedralled outer panels were attached; the whole of the wing’s trailing edges was hinged on the Junkers ‘double-wing’ principle, the inboard and outboard sections serving as flaps and ailerons respectively. The airframe was completed by the fixed tailwheel landing gear, which comprised a faired tailwheel at the extreme rear of the fuselage and two main units extending below the ‘knuckles’ in the wings, enclosed in very substantial ‘trouser’ fairings and braced to the fuselage on each side by single inclined struts. The Ju 87 V1 suffered from engine overheating during its first flight, and was soon revised with a larger coolant radiator moved farther forward under the nose into the chin position. Although not fitted on the Ju 87 V1 as it was not yet ready, a dive-brake system was planned for the type: this comprised slatted brakes installed just behind the wing leading edges outboard of the main landing gear legs and designed to turn through 90° and thus check the dive-bomber’s acceleration once the pilot had rolled his aeroplane into the attacking dive. As diving trials were undertaken during the summer of 1935, the tail unit began to oscillate in the dive and, as the pilot attempted to pull out of the dive, the starboard vertical tail surface broke away and the Ju 87 V1 was lost in the resulting crash. At this time the Ju 87 V2 second prototype was approaching completion with a powerplant of one Junkers Jumo 210Aa liquid-cooled inverted V-12 engine rated at 610 hp (485 kW) at 8,530 ft (2600 m) and driving a three-blade metal propeller of the variable-pitch type. The completion of this aeroplane was halted as an investigation determined the cause of the Ju 87 V1’s loss, and as a result the Ju 87 V2 was completed with a revised tail unit carrying a single vertical surface located on the centreline. The Ju 87 V2 first flew in the late autumn of 1935, and was joined in the flight test programme just before the end of the year by the Ju 87 V3 third prototype (D-UKYQ), whose major changes were a revision of the engine bearers to lower the thrust line and thereby improve the pilot’s forward and downward fields of vision, and a further revision of the tail unit with an enlarged vertical surface supplemented by two small endplate surfaces. The Ju 87 V2 was fitted with its dive brakes in the first part of 1936 and delivered for its official trials in March of that year, its competitors for the Luftwaffe order being the Arado Ar 81 two-seat biplane with fixed landing gear, the Heinkel He 118 two-seat monoplane with retractable landing gear, and the Hamburger Flugzeugbau (later Blohm und Voss) Ha 137 single-seat monoplane with fixed landing gear. The last had been designed as a private venture by Dr Richard Vogt, who felt that his type of tubular spar, sealed to provide fuel tankage, would be ideally suited for a highly stressed type such as a dive-bomber. Even before the competition, the Ju 87 and He 118 had been fixed as the prime candidates for selection and each ordered to the extent of 10 pre-production aircraft. The Ar 81 was declared a back-up type and, not meeting the full requirement, the Ha 137 was included only for comparative purposes. In the official trials the Ju 87 was deemed decisively superior to the He 118 and ordered into production. This did not mean that the type and indeed the dive-bombing concept were without their opponents, however, for Oberst Wolfram von Richthofen, head of the development section of the German air ministry’s technical department and later the Luftwaffe’s premier tactical air power commander, asked for the type to be cancelled. Only one day later, however, von Richthofen was replaced as head of the technical section by Ernst Udet, Germany’s second highest-scoring fighter ace of World War I and a dedicated proponent of the dive-bomber concept, and the Ju 87’s future was assured. Up to this time the Ju 87 had incorporated no fixed forward-firing armament or bomb-release gear, but this situation was rectified in the Ju 87 V4 fourth prototype (D-UBIP), which was already under development as the production prototype. This was fitted with a single 0.312 in (7.92 mm) MG 17 fixed forward-firing machine gun in the leading edge of the starboard wing outboard of the main landing gear unit and, under the fuselage immediately to the rear of the radiator installation, a bomb-release crutch. This could carry one 551 lb (250 kg) bomb or, if the aeroplane was flown as a single-seater, one 1,102 lb (500 kg) bomb that was swung clear of the propeller disc before it was released. Other changes incorporated in the Ju 87 V4 were a further lowering of the engine thrust line, a still larger vertical tail surface of more angular shape, a longer wheel base, longer-stroke shock absorbers in the main landing gear units, revised main landing gear ‘trousers’, and a modified rear section for the ‘glasshouse’ canopy. The Ju 87 V4 paved the way for the Ju 87A-0 pre-production model, which differed from its predecessor in only four respects: the powerplant was changed to one Jumo 210Ca liquid-cooled inverted V-12 engine rated at 600 hp (447 kW) for take-off and 640 hp (477 kW) at 8,860 ft (2700 m); to simplify production; the wing was modified with straight rather than compound taper on the leading edge together with an increased taper angle on the trailing edge so that wing area would not be increased by the continuation of the inboard leading-edge taper angle right to the tip; the rear-seater was provided with a 0.312 in (7.92 mm) MG 15 trainable rearward-firing machine gun for defensive purposes; and an Askania autopilot was installed. This last was deemed necessary as the pilot might lose consciousness as a result of the high g forces during the pull-out after bomb release, and was designed to complete the pull-out and initiate the climb back to altitude, in the course of which the pilot would recover if he had indeed blacked out. The Ju 87A-0 was delivered from a time late in 1936. The Ju 87A-0 was followed in the early part of 1937 by the first Ju 87A-1 full-production aircraft. This initial model had the same powerplant and armament as the Ju 87A-0, which was of the pattern established in the Ju 87 V4. The Ju 87A-1 was dimensionally identical to the later Ju 87B-2 with the exception of its length of 35 ft 5.25 in (10.80 m) and height of 12 ft 9.5 in (3.90 m), and otherwise differed in details such as its empty weight of 5,104 lb (2315 kg), maximum take-off weight of 7,495 lb (3400 kg), maximum speed of 173 kt (199 mph; 320 km/h) at 12,140 ft (3700 m), maximum cruising speed of 148 kt (171 mph; 275 km/h) at 8,860 ft (2700 m), economical cruising speed of 140 kt (161.5 mph; 260 km/h) at optimum attitude, service ceiling of 22,965 ft (7000 m), and maximum range of 540 nm (621.5 miles; 1000 km). During the early spring of 1937, the I Gruppe of Stukageschwader 162 began to convert from the Hs 123 onto the Ju 87A-1 as the pioneer operational user tasked with the development of the right tactics for the Stuka. 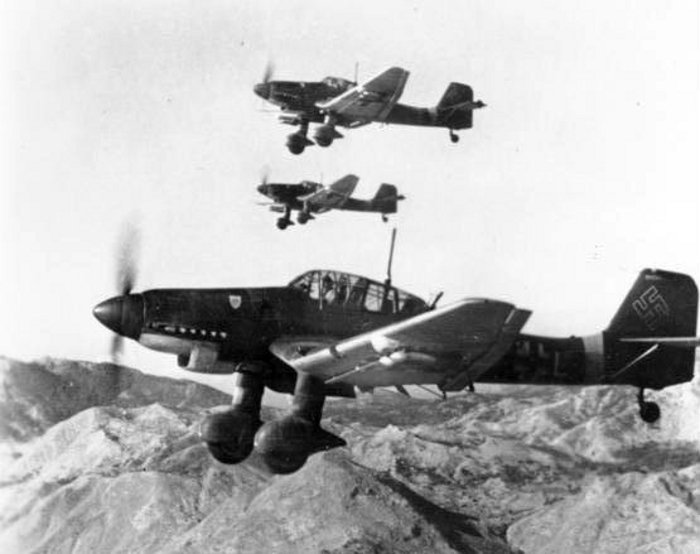 Late in the same year, Stukageschwader 163 (ex-I/StG 162) detached a flight of three Ju 87A-1 dive-bombers to the Spanish Civil War (1936/39), in which the Germans were providing support for the Nationalist insurgents against the Republican government. The aircraft proved very useful despite their limited numbers, and personnel of StG 163 were rotated through Spain on a regular basis to gain operational experience on the Ju 87A-1. By this time the Luftwaffe was planning to operate a total of six Stukagruppen, of which four (I and II/StG 163, III/StG 162 that later became I/StG 2, and III/StG 165 that later became III/StG 51) were to be equipped with 156 examples of the Ju 87 at the rate of 36 aircraft per Gruppe (wing) and three aircraft for the Stabsschwarm (headquarters flight) attached to each Gruppe. Late in 1937, the Ju 87A-1 was replaced in production by the Ju 87A-2 that differed only in having an uprated engine, namely the Jumo 210Da unit with a two-stage supercharger, rated at 680 hp (507 kW) for take-off and 670 hp (499.5 kW) at 12,800 ft (3900 m), and driving a three-blade metal propeller with wider-chord blades. Production of the Ju 87A series was terminated during the summer of 1938 after the delivery of some 200 aircraft, for the advent of the more powerful Jumo 211 engine had made feasible the Ju 87B improved model that drew considerable advantage from extensive redesign. Such was the pace of production of this improved model that all surviving Ju 87A dive-bombers had been withdrawn from front-line service and passed to training units by the start of World War II in September 1939. The Jumo 211 was basically an enlarged and therefore more powerful development of the Jumo 210 used in the Ju 87A series, and had been tested in the Ju 87 V6, which was a conversion from Ju 87A-1 standard, and then in the Ju 87 V7 that was the prototype for the Ju 87B series. The redesign that produced the Ju 87B retained only the wing and horizontal tail surface of the Ju 87A, the remainder of the airframe being essentially new and embodying a combination of major aerodynamic and structural changes. The whole fuselage was reshaped, the cockpit canopy was completely redesigned with rearward-sliding rather than folding access/egress sections, the vertical tail surface was enlarged still more, the braced main landing gear units were replaced by cantilever units with the original type of long-chord ‘trousers’ replaced by trimmer fairings carrying the wheels in large spats, and the fixed forward-firing armament was doubled by the incorporation of a 0.312 in (7.92 mm) MG 17 machine gun in the leading edge of the port wing. The Ju 87B-0 pre-production and service test type had the powerplant of one Jumo 211A engine rated at 1,000 hp (746 kW) for take-off and 975 hp (727 kW) at 13,780 ft (4200 m). In the Ju 87B-1 initial production version the Jumo 211A engine was replaced by the Jumo 211Da unit with a fuel-injection rather than carburettor system, and ratings of 1,200 hp (895 kW) for take-off and 1,100 hp (820 kW) at 4,920 ft (1500 m). As well as improving performance to a tactically important extent, the uprated powerplant also meant that the Ju 87B-1 could carry the 1,102 lb (500 kg) bomb with a crew of two embarked, and this gave the heavily laden aeroplane at least a measure of defensive firepower that would otherwise have been lacking; the alternative weapon load was a single 551 lb (250 kg) bomb carried on the underfuselage crutch and four 110 lb (50 kg) bombs carried under the outer wing panels. Five early production examples of the Ju 87B-1 were sent to Spain for operational evaluation in October 1938, and revealed considerably better capabilities than the trio of Ju 87A-1 machines that had preceded them. The Luftwaffe was very happy with this situation, and also with the fact that the production rate of the Ju 87B-1 was accelerating as construction had been switched from Junkers to the ‘Weser’ Flugzeugbau. Deliveries of the Ju 87 totalled only 395 aircraft in 1937 and 1938, but by mid-1939 ‘Weser’ was building 60 aircraft per month and deliveries by the end of the year amounted to 557 aircraft. On the outbreak of World War II, all nine of the Luftwaffe’s Stukagruppen were equipped with the Ju 87B-1, of which 336 were in the current inventory. Operating under conditions of local if not total air superiority, the Ju 87B-1 proved a decisive weapon in the Polish campaign. The aircraft ‘softened up’ the areas planned for the German army’s main attacks by attacking communications and rear-area concentrations, and then embarked on a programme of attacks on Polish airfields, naval installations, bridges, tunnels and other communications chokepoints. The force was also available to provide support for the ground forces as and when required. Ju 87B-1 losses in the campaign were 31 aircraft, or approximately 10% of those committed, but the legend of the Stuka had been born. By the end of 1939 the Ju 87B-1 had been replaced in production by the Ju 87B-2 that introduced individual ejector exhaust stubs for a measure of thrust augmentation, hydraulically operated radiator cooling gills, and the improved Junkers VS-5 propeller with broader-chord blades. This model could lift a bomb load of 2,205 lb (1000 kg) when flown as a single-seater, and subvariants produced by the incorporation of Umrüst-Bausätze (factory conversion sets) included the Ju 87B-2/U2 with improved radio equipment (also retrofitted on the Ju 87B-1 to create the Ju 87B-1/U2), the Ju 87B-2/U3 with additional armour protection for the close-support role, and the Ju 87B-2/U4 with ski rather than wheel landing gear. There was also a Ju 87B-2/Trop version for service in North Africa with sand filters and a pack of desert survival equipment, and both this model and the standard Ju 87B-2 were delivered to the Italian air force from the summer of 1940. Other Ju 87B-2 aircraft were delivered to Bulgaria, Hungary and Romania. Before the outbreak of World War II there had been a revival of the camp within the German military establishment that argued for the Ju 87’s retirement on the grounds that it was technically obsolete, and would therefore suffer heavy combat losses. The type’s success in the Polish campaign seemed to put the lie to this assertion, and the pro-Ju 87 camp, headed by the Luftwaffe’s commander-in-chief, Generalfeldmarschall Hermann Göring, prevailed to the extent that the Ju 87B was retained in production right through 1940, when 611 aircraft were delivered, and into the spring of 1941 before being replaced in production not by a new type of warplane but by the Ju 87D improved version. The far-sightedness of the pro-Ju 87 camp seemed to have been justified in the campaign which Germany launched in May 1940 against the Low Countries and France, when a mere 14 aircraft were lost in the first four days of hectic fighting, but was finally revealed as a fallacy during the Battle of Britain. In this campaign the Ju 87B had to be withdrawn temporarily after suffering catastrophic losses (41 aircraft in a mere six days) during attacks on point targets such as British radar stations and air bases close to the south coast of England. The Ju 87B was used in only two further attacks on British targets, losing nine and 16 aircraft respectively in these smaller-scale efforts. Although its tactical defeat in the Battle of Britain signalled the desperate vulnerability of the Ju 87 when not operating under an umbrella of German fighters, this was not the end of its career as there was no replacement for the type, or of its utility as revealed in later campaigns in which the Luftwaffe would have air superiority. Thus the Ju 87B enjoyed considerable success in the first part of 1941, when it was deployed to North Africa and Sicily to attack British convoys in the Mediterranean, in April 1941 when a force of 414 (later increased to 541) such aircraft was mustered for the German invasion of Yugoslavia and Greece, in May 1941 when the type scored considerable success in support of the German airborne invasion of Crete, in June 1941 when most of the surviving aircraft were used for the support of Operation ‘Barbarossa’, the German invasion of the USSR, and in the later part of 1941 when a number of the aircraft were deployed to North Africa for the support of the Deutsches Afrika Korps. It was the steadily increasing rate of losses in the Soviet and North African campaigns that finally tolled the death knell for the Ju 87B, which was relegated to the training role from the middle of 1942. In 1938 it had been decided that a Staffel of Ju 87 dive-bombers should be included in the air group being planned for Germany’s first aircraft carrier, which was in the early stages of construction and was to be named as Graf Zeppelin later in the year. Junkers was instructed to develop a carrierborne version of the Ju 87B, and this Ju 87C was evolved with features such as manually folding outer wing panels, catapult attachments, an arrester hook, flotation equipment and, to facilitate ditchings at sea, main landing gear units that could be jettisoned in emergencies. The construction of a small batch of Ju 87C-0 pre-production aircraft was undertaken from mid-1939 by ‘Weser’, and Junkers then moved forward to the design of a definitive Ju 87C-1 with electrically folding outer wing panels, increased fuel tankage, and provision for the carriage of a torpedo in place of bombs under the fuselage. Although construction of Graf Zeppelin was 85% complete on the outbreak of World War II, further work on the ship was then postponed and the aircraft carrier was never finished. Not required for carrierborne use, therefore, the Ju 87C-0 aircraft were employed operationally in the Polish campaign and then relegated to experimental tasks, and the Ju 87C-1 was cancelled. The Ju 87C-0 was dimensionally identical to the Ju 87B-2, but differed in details such as its empty weight of 8,058 lb (3655 kg), normal take-off weight of 8,818 lb (4000 kg), maximum take-off weight of 11,772 lb (5340 kg), and maximum speed of 186 kt (214 mph; 345 km/h) at 16,405 ft (5000 m) declining to 159 kt (183 mph; 295 km/h) at sea level. Produced in parallel with the Ju 87B with a letter suffix standing for Reichweite (range), the Ju 87R was a long-range version of the Ju 87B intended for anti-ship and other extended-endurance missions. The primary changes introduced to create the Ju 87R were a structural revision of the outer wing panels to incorporate two 33 Imp gal (39.6 US gal; 150 litre) tanks that supplemented the standard pair of 52.8 Imp gal (63.4 US gal; 240 litre) tanks in the inboard wing panels, and the introduction of ‘plumbed’ hardpoints under the outer wings, which thus carried two 66 Imp gal (79.25 US gal; 300 litre) drop tanks in place of the quartet of 110 lb (50 kg) bombs. The underfuselage load was limited to a single 551 lb (250 kg) bomb. The Ju 87R entered limited service in the spring of 1940 and first saw operational service in the Norwegian campaign that started in April 1940. The type was produced in four subvariants as the Ju 87R-1 that was identical to the Ju 87B-2 except in the details listed above, and the Ju 87R-2, Ju 87R-3 and Ju 87R-4 that differed primarily in the type of equipment, especially radio, that was installed. Manufacturer: Junkers Flugzeug- und Motorenwerke A.G.